Add some brightness to your soiree with these colorful tea parties. Use the suggestions below and paint the world - or at least your corner of it! "Color Me Orange" says your invitation. It also states that your guest is to come to the party wearing orange. You use orange and white linen and dishes - solid or with an orange pattern. Use a centerpiece of orange and white flowers. Include food that is orange, such as oranges, carrots, and sweet potatoes. You can use some orange dye in your icing on the teacake. Serve orange tea. Just don't go overboard, you want the theme to be orange, but you don't want your guests to turn orange. Make sure what you pick, is tasteful and aesthetic. The limit could depend on the color; some colors go better with food than others. Have guests wear their favorite color and bring along a food that has that favorite color incorporated into it. Colorful tea parties can celebrate the selected holiday with the association of its color, such as red and green for Christmas. With a church teatime and the message of God's promises. For a children's teatime, used in conjunction with or without Noah's ark. Can be used along with a "luck of the Irish" theme party. Use all colors of the rainbow together or use each color separately for individual impact. *Remember the acronym for the rainbow colors? Roy G. Biv. - Red, orange, yellow, green, blue, indigo, violet. 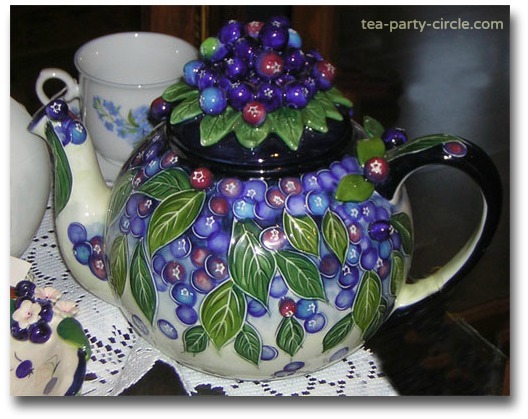 These teatime themes are best when used with freshly picked fruit of the season. Strawberries and cream - use red and cream hues for decoration. Then serve fare such as strawberry bedecked teacake, strawberry torte, strawberry tea, strawberry jam and of course, plenty of clotted cream with the scones. In summer, freeze strawberries in ice cubes and serve with iced tea and/or slice berry partway and sit on edge of glass. *Alternatives are peaches and cream, blueberries and cream, plums and cream. What's Your Birth Color ? Do you know what your Birthstone color is? In the United States there is an official birthstone for each month of the year. Colorful teatime parties with this theme would be great for the birthday girl because you can not only capitalize on the birth color but add a little glamour to the party! For example, November’s birthstone is a Topaz, which is a yellow-gold color. Use this color in your invitations with some gold glitter or stickers. For decorations, use gold napkins and tablecloth, sprinkle “fake” topaz gems over the table (found in some party stores). For a craft, you could make necklaces with gold beads. Name the food things like "gold ambrosia" and "topaz tarts". Could work for an anniversary as well or even a new baby!